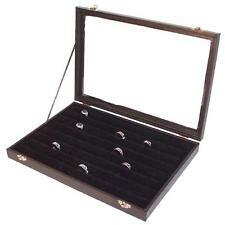 This black felt ring tray has slots to display up to 72 rings. It has a hinged glass cover to keep your rings clean and safe. The glass is much less likely to get scratched like plexiglass lids do and will keep its clearness. This covered and latching display will really cut down on theft of your rings while still giving your customers a clear view and keeping them free of dust. Dimensions: 9.5" x 14" x 2"